The UN observer sent to commemorate the event said it all. The peaceful transfer of power from the National Transitional Council to the newly elected Libyan parliament “surprised the world.”. Mustafa Abdel Jalil, the head of the NTC during the transitional period, handed the baton to parliament, which was buzzing with deliberations about who the speaker of the house would be, and who the prime minister. Independent, nationalist, and Muslim fundamentalist candidates are all in consideration. A controversy continued about the writing of a new national constitution. The NTC had attempted to ensure that the constituent assembly would be directly elected by the people, but many in parliament feel that that body should appoint the drafting committee. My suspicion is that the NTC moved to favor an elected body out of fear that parliament might be dominated by the Libyan version of the Muslim Brotherhood. But in fact the Justice and Construction Party did not do that well in the parliamentary elections and probably could not craft a theocratic charter, and so perhaps the method of choosing the constituent assembly is not so urgent. Despite some continuing security problems (which are exaggerated by outsiders in my experience), Libyans were able to have free and fair elections, with only a tiny number of polling stations closed for security reasons. Women won some 20% of the seats, and an unveiled woman made some waves by making some remarks in parliament to mark the transition. An elected prime minister with the backing of the parliament will have a national authority that the NTC signally lacked, and should be able to move to rebuild the national army, the police, and to get the ministries operating. Libya has a significant income from its oil exports, now back up to pre-revolution levels, and so monetary resources are not the problem so much as managerial capacity to spend the money promptly and wisely. In general, Libya reminded me much more of Jordan than it did of a failed state like Yemen. (Of course, that it seems to me like Jordan, including with regard to the quality of the infrastructure, is a sad commentary on how Muammar Qaddafi pissed trillions of its income away down the toilet of African wars and other boondoggles, reducing the population to a third world existence when they could have had an advanced country). As a historian, I can’t avoid taking this occasion as an opportunity to review some of the milestones in Libya’s modern history. I would say it began with the Spanish conquest of Tripoli in 1510. 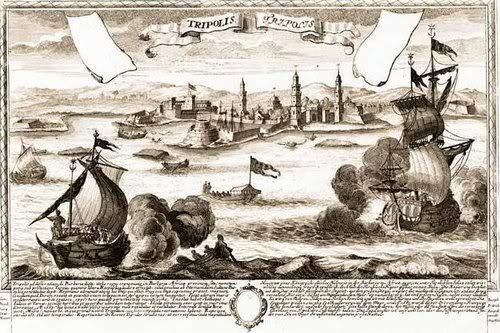 After a brief period of rule by pirates 1538-1551, Tripoli fell to Sulayman the Magnificent’s Ottoman army in 1551. 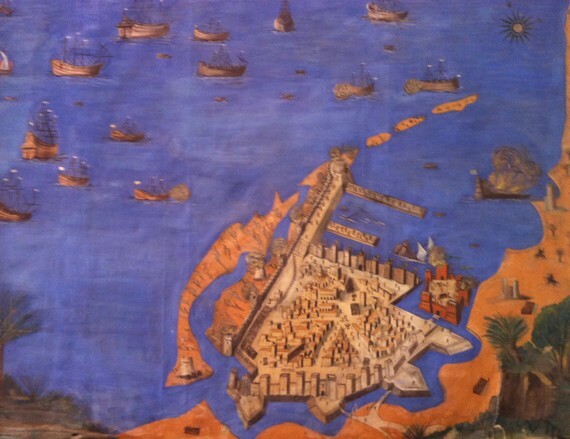 The Ottomans ruled loosely, through vassals, though they did garrison the coastal cities, and their officers threw up a vassal state in the 18th century under the Karamanlis. The young United States briefly blockaded Tripoli and took Derna in the early 19th century, over the issue of piracy, though the Libyans captured the USS Philadelphia and kept it until 1804. (There is a restaurant named “The Philadelphia” celebrating this incident in Tripoli today). In the nineteenth century, the reformist and sometimes militant Sanusi Sufi order of Muslim mystics gained power under light Ottoman rule in the Benghazi region. 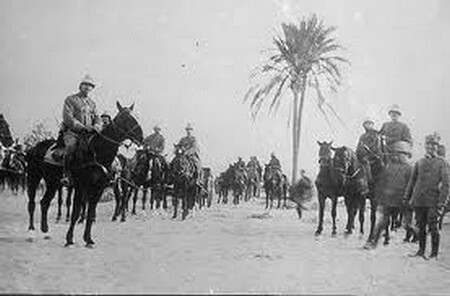 In 1911, Italy invaded and colonized Libya, keeping it until the Allies expelled Mussolini’s fascist troops in 1943. During the Italian period, Libyans mounted repeated challenges to European rule, especially the rebellion of Omar Mukhtar, whose image was a favorite of grafitti painters during the 2011 revolution against Qaddafi, who was seen as a new Mussolini. After a brief period of British administration, in 1949 the United Nations began overseeing a transition to Libyan independence. In 1951 the Sanusi leader Idris was installed as king. Idris was a somewhat reluctant monarch and not a very good leader, and while a parliament was elected, parties were discouraged and it was more of an advisory council of notables. Idris’s Libya looked more like the Gulf monarchies than like the rest of North Africa; it had British and an American base and began developing a petroleum industry. It was seen by the West as an ally in the Cold War struggle against the Soviet Union. King Idris was overthrown in a military coup in 1969 by a group of young officers led by Muammar Qaddafi, then a charismatic and popular young Arab nationalist who admired Egypt’s Gamal Abdel Nasser. Qaddafi gradually went insane, imposing on his long-suffering people a staccato series of bewildering policy changes that kept the country’s institutions in constant flux and destroyed its economy and civil society, while dragging the country into a series of imperial military adventures in Africa. Tripoli grafitti from 2011: Muammar Qaddafi (Gaddafi) as rat. Photo by Juan Cole, May, 2012. Qaddafi was overthrown by a popular uprising a little less than a year ago, and in the interim Libya was guided by an unelected National Transitional Council, which was frequently criticized for not being decisive or vigorously addressing the country’s postrevolutionary problems. Regime change came in Libyan history by foreign conquest (Spain, the Ottomans, Italy, and the British), by military coup (Qaddafi and his Janissary predecessors of the 18th century), or by revolution (2011, though Idris’s Sanusis allied with the British in World War II to overthrow the Italians, so there was a popular revolutionary element to that transition). But Mustafa Abdel Jalil was not overthrown, nor has Libya been invaded by a foreign power with troops on the ground. Mustafa Abdel Jalil stood at a podium, and tendered his resignation in favor of the elected representatives of the people. All the naysayers and skeptics about Libya should give it a rest today, and congratulate our Libyan brothers and sisters on a magnificent historical achievement, and wish them well. Achieving a republic, as Ben Franklin implied, is easier than keeping a democracy. Libyans have made a good first step toward the latter.